The first thing I noticed was the silence. It was eerily quiet it when we walked down towards the water. 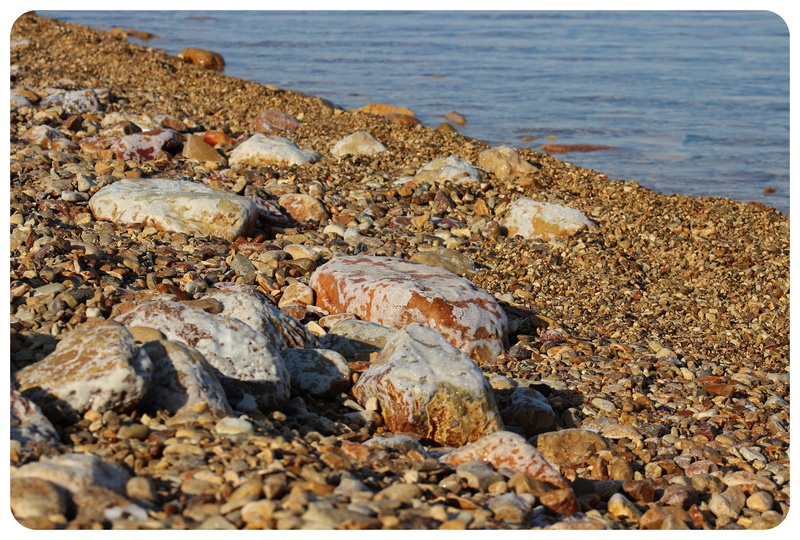 All you could hear was the crunching sound of the pebble stones under our feet, and some laughter in the distance, a reminder that we were not the only ones here, but we moved away from the small area where people were gathering to take a dip in one of the world’s saltiest inland lakes. We knew exactly where we wanted to go: a small patch filled with mud that a local had pointed out to us, a bit further down the shore. 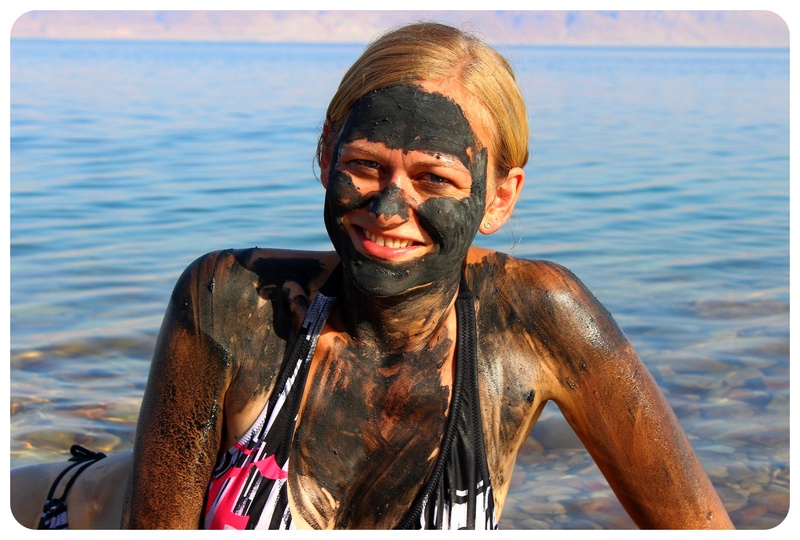 The mud of the Dead Sea is known for being rich in minerals and I had two goals for the day: giving myself a Dead Sea mud facial and floating in the salty water. 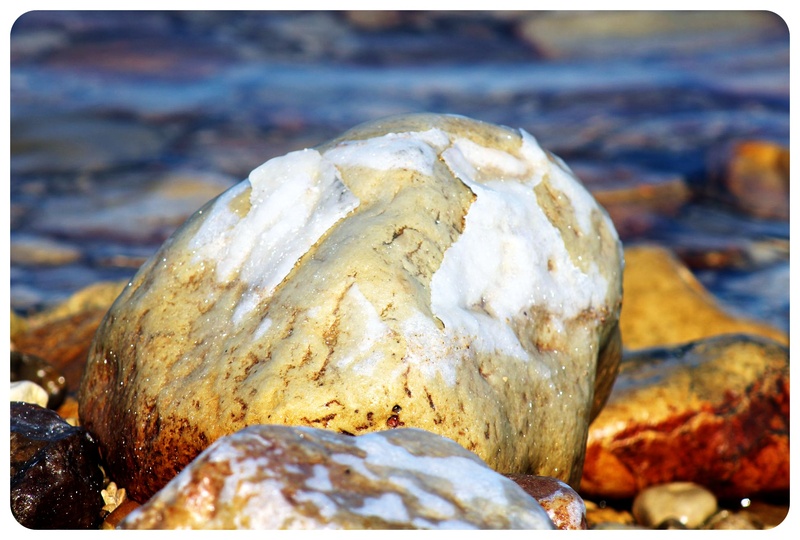 I could already see the salt through the clear water, covering rocks in the Sea, but also outside of the water, where white salt crystals were slowly crumbling off the big rocks it covered, twinkling in the afternoon sun. 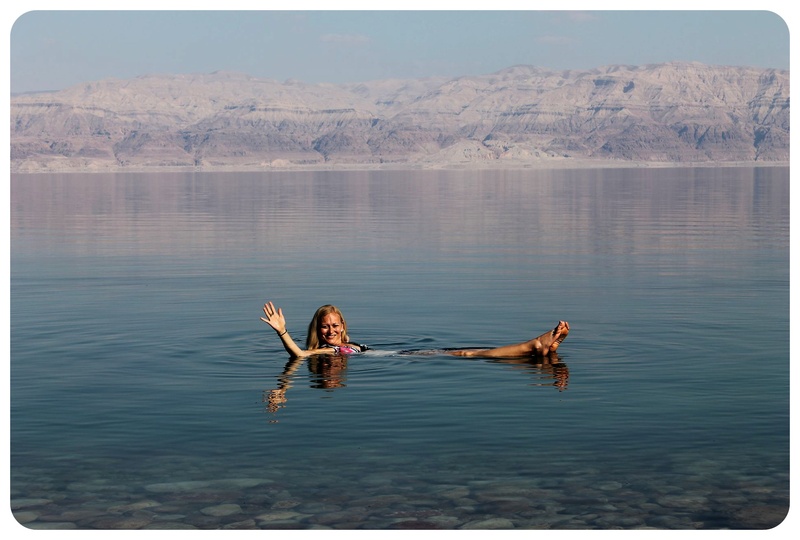 The Dead Sea definitely lives up to its name: there is no sign of life anywhere around the water. No trees, no bushes, no animals. It was one of the most barren places I have ever visited; the only other place somewhat similar I’d ever been to was Lake Powell on the border of Arizona and Utah, a lake surrounded by white chalk cliffs (however, that one is a fresh water lake). 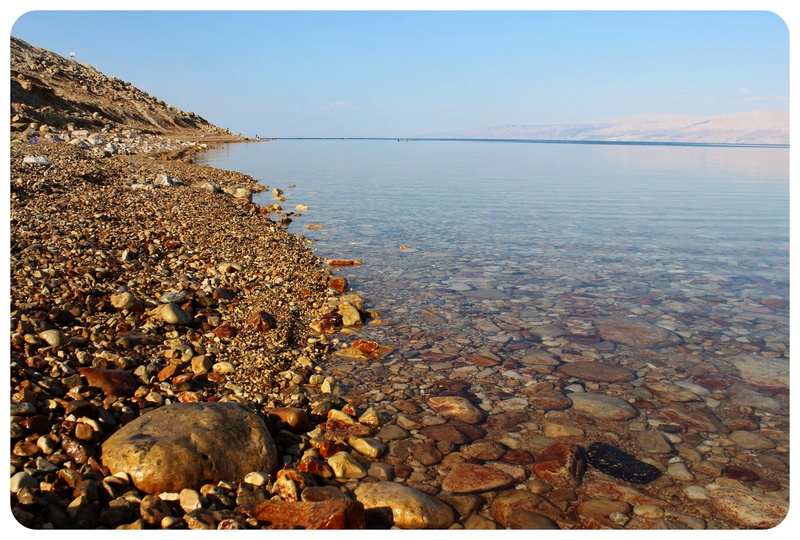 The Hebrew name of the Dead Sea, Yam Hamelakh, is very fitting as well, translating to The Salt Sea. 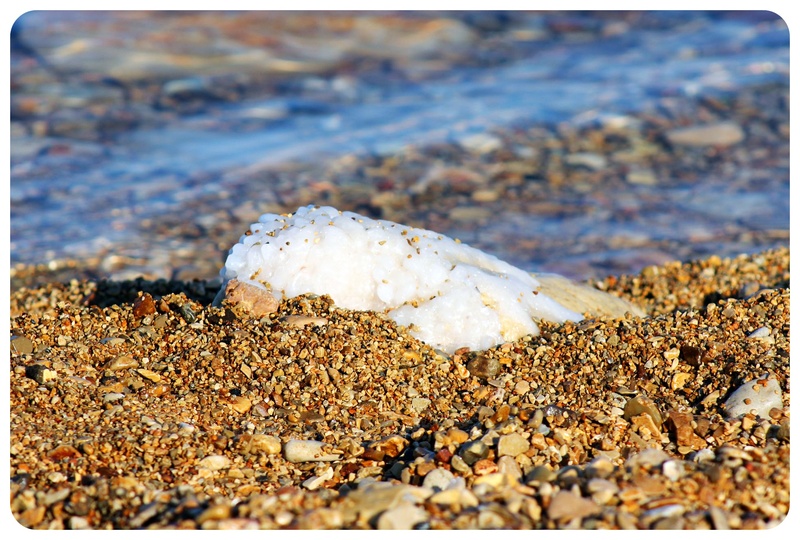 The salinity of it is 34 per cent – ten times higher than in the ocean, and more than double of Utah’s Great Salt Lake. As soon as we reached the mud hole, I stripped down to my bikini and ran into the water, excited about a refreshing dip. But the moment my feet touched the water I realized that this would be anything but refreshing – the water was almost bathtub warm. The water has the same temperature all year around, by the way, at about 72 °F (22 °C). 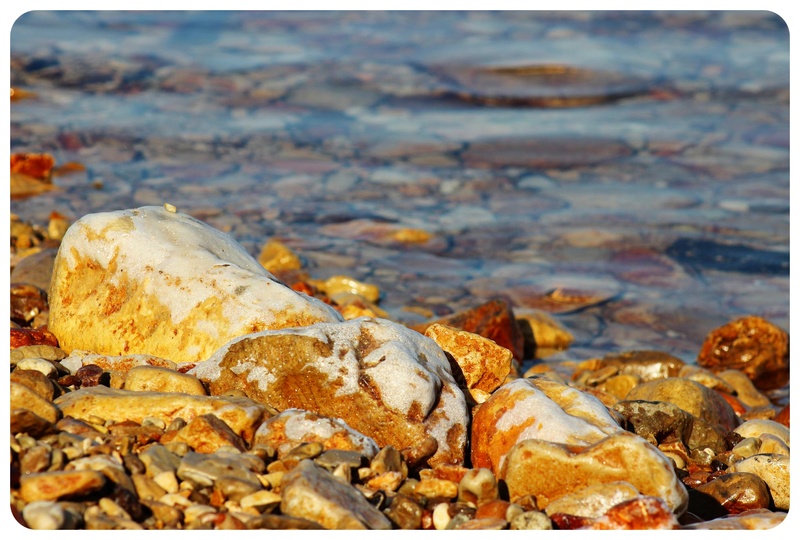 The high level of salinity was visible right away, making the water look almost oily, similar to the trace suntan lotion leaves on the water surface, just tenfold. I walked further away from the shore into the deep blue water… and then I floated. It felt bizarre that I couldn’t stand on the ground but as hard as I tried, my feet wouldn’t touch it. With a depth of 1,237 feet (377 meters), I felt more comfortable that way though, since I prefer waters where I can see the ground. 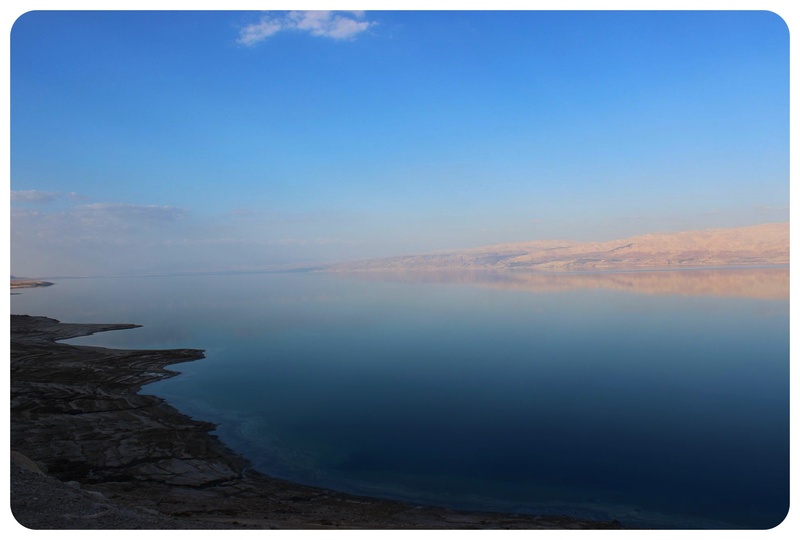 Its deep waters combined with the fact that the Dead Sea is already the lowest place on earth, 1,401 feet (427m) below sea level, the quietness surrounding it and the literally dead environment make this one of the most fascinating places I’ve ever been to. While it seemed tempting to just float for a while, I felt the salt that evaporates from the water burn in my eyes and couldn’t resist the urge to rub my eye. With my salty fingers. 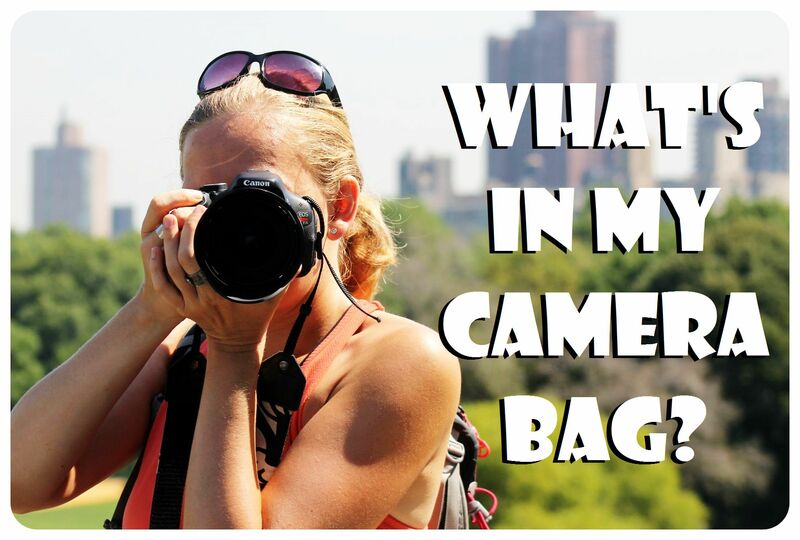 A bad idea, as it turned out: a stream of tears was running down my face immediately, and the stinging pain in my red, inflamed eye reminded me of the incident all day long. 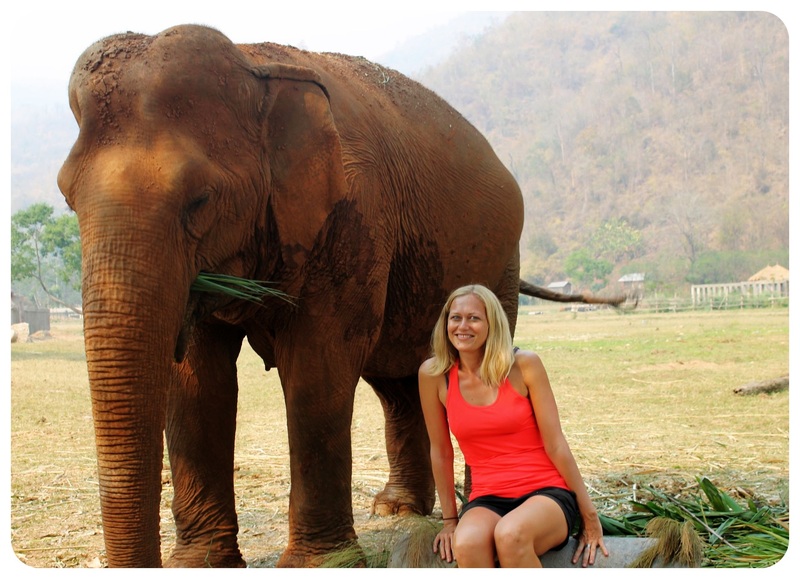 Once I had cleaned my eye with some drinking water, it was time for my mud treatment! 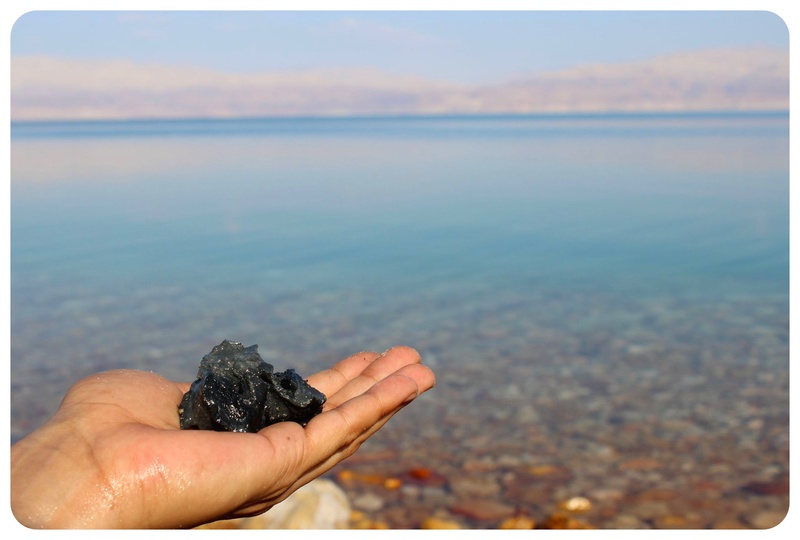 The minerals you find not only in the salts but also the mud of the Dead Sea are known for their healing powers, especially for skin diseases but also sicknesses like arthritis and osteoporosis. 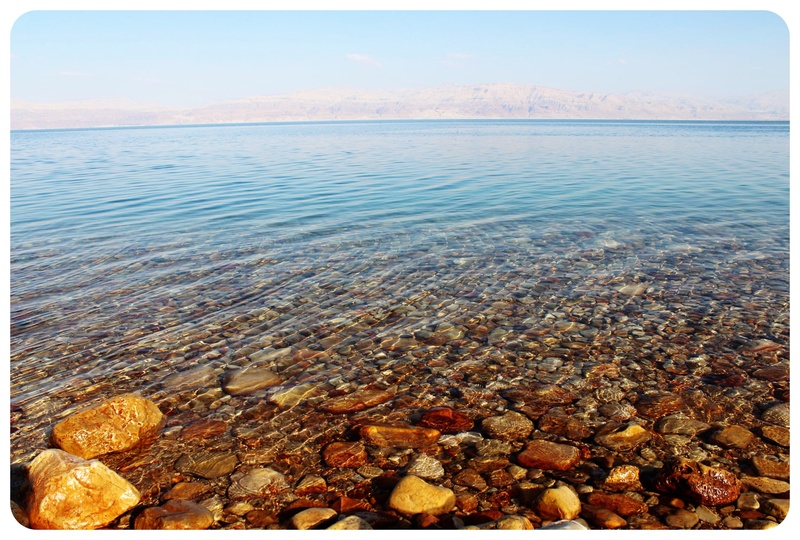 On the southern shores, there are several big hotels both in Jordan and in Israel that offer special Dead Sea treatments for their guests, and many people come here just for this reason. I ignored the sulfur smell of the mud and spread it all over my body, gave me a nice facial and waited for it to dry. After I washed it off, my skin felt amazingly soft and I wished I’d live somewhere nearby so that I could come here for a weekly skin treatment 🙂 We decided to leave the beach and to keep driving along the Dead Sea, which stretches for 34 miles (55 km) from south to north. Its narrow width of only 11 miles (18 km), made me almost want to attempt to swim over to Jordan, whose reddish mountains were in my view the entire time across the water. 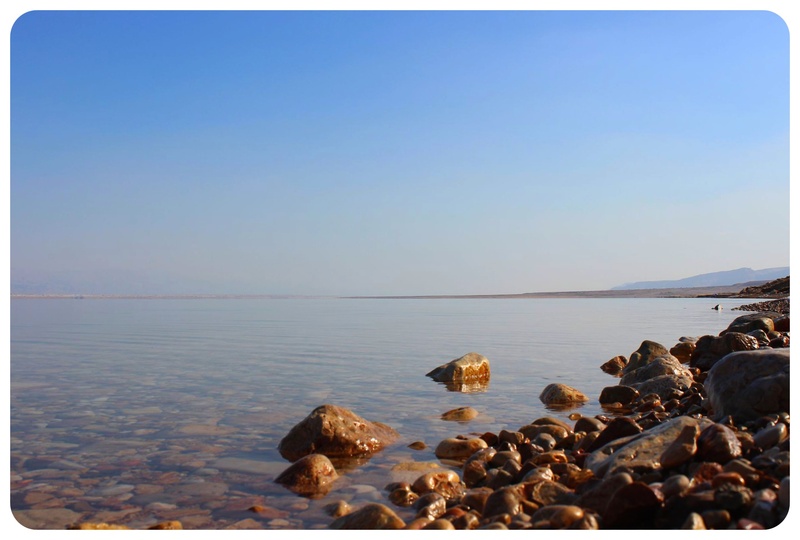 Both Jordan and Israel have contributed to the fact that the Dead Sea is shrinking rapidly by using it industrially – this photo, taken from space, shows the shocking difference of the size of the Dead Sea in 1972, 1989 and 2011. The northern part and the southern part are not even connected any more! Asher, my tour guide on the Israel National Trail hike, put it like this: ‘We became too greedy. And now we’re paying for it.’ In 2012, it was reported that it had shrunk a record 1.5 meters (4.9 feet) within the span of 12 months. 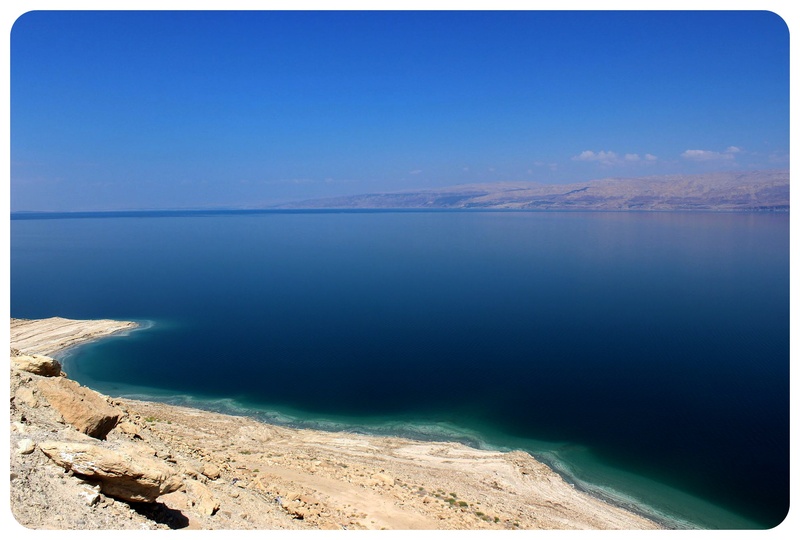 Fifty years ago, the length of the Dead Sea was still 47 miles (75 kilometers), which is a drastic difference to the current length of 34 miles. 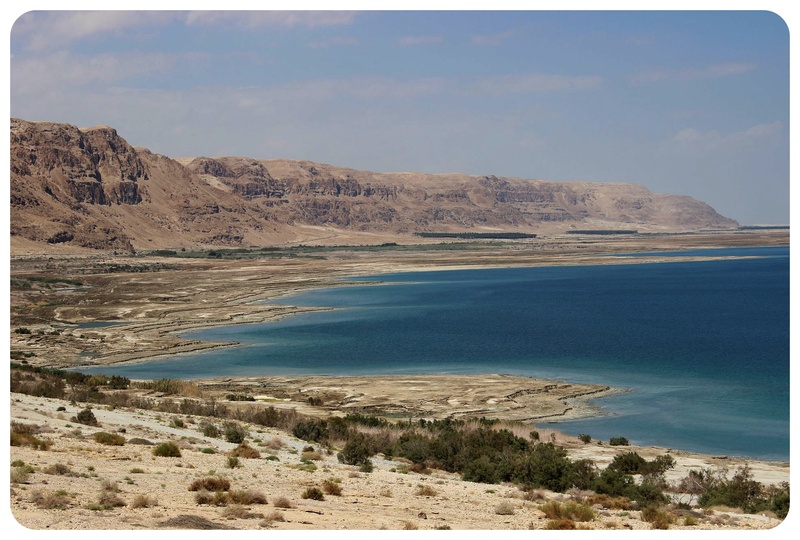 Following this dramatic decline, Jordan, Palestine and Israel signed an agreement to pump water from the Red Sea into the Dead Sea in order to stop the rapid shrinking. The project is, however, quite questionable and controversial. 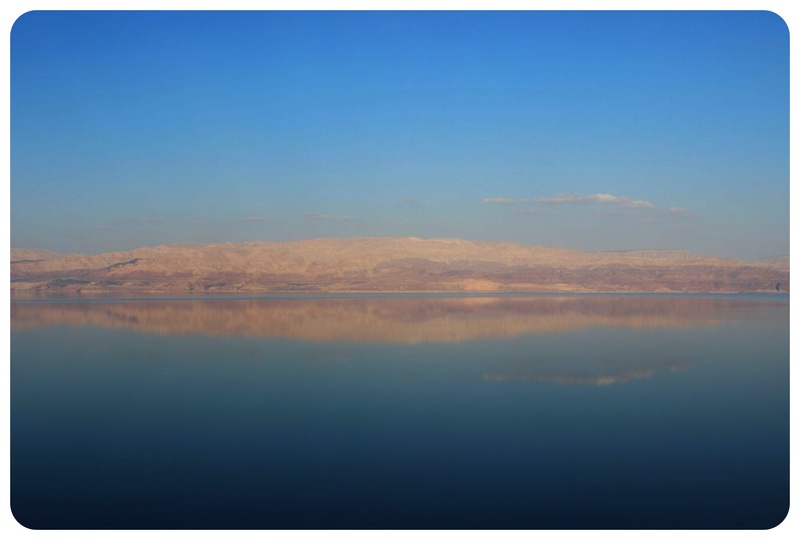 As we drove down Highway 90, which follows the entire length of the Dead Sea on the Israeli side, I couldn’t get enough of the breathtaking views over the dark blue water and the desert landscape around it. Because it is impossible for any life to thrive around there, there is barely any life around it, except for some industrial sites and hotels in the south. 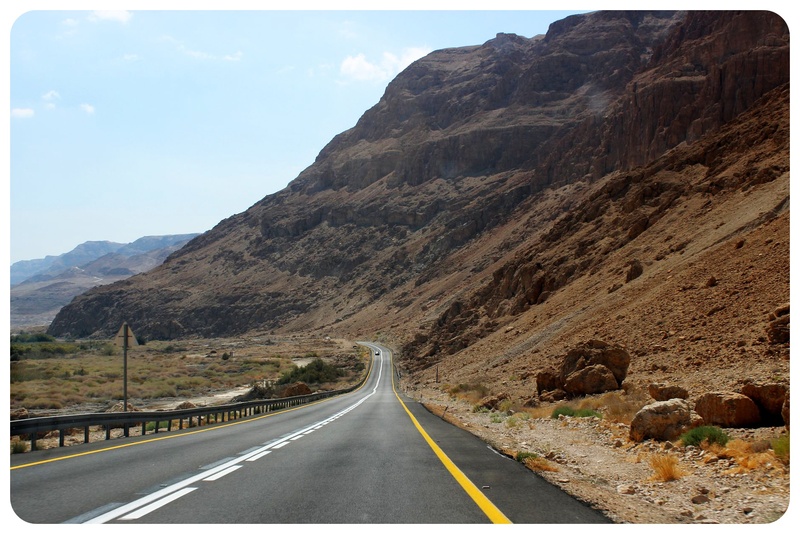 One exception is Ein Gedi, a little oasis in the desert, right off the Highway. It was bizarre to be surrounded by lush vegetation all of a sudden, after spending the day along the desolate shores of the Dead Sea. 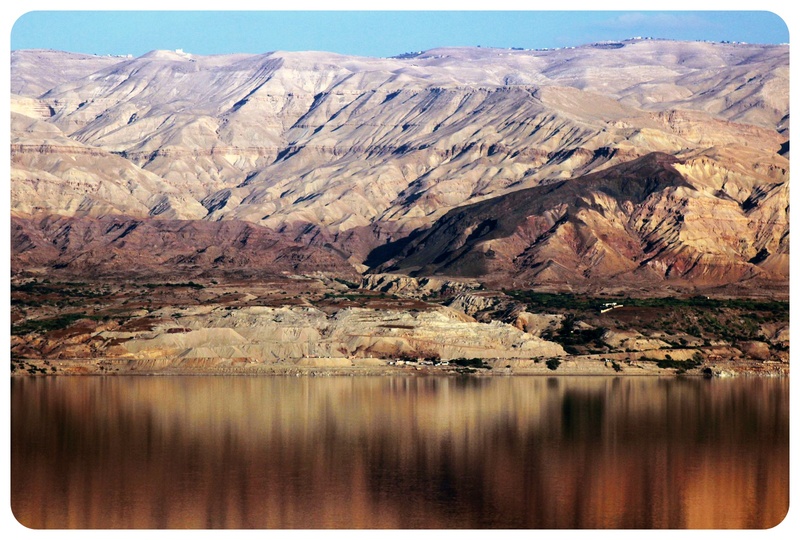 There is a hike that starts at the bottom of the mountain and leads all the way to its top, offering spectacular views over the Dead Sea, and refreshing breaks along the way, which come in the form of several waterfalls. Considering that temperatures in this area are high throughout the year (86°F / 30° C during the winter and up to 104°F /40° C during the summer), it was a glorious feeling to step into the cool pools of the waterfalls and let the water run down to my back – it was the perfect ending to an unforgettable day – and it got me excited about my 4.00 am (!) 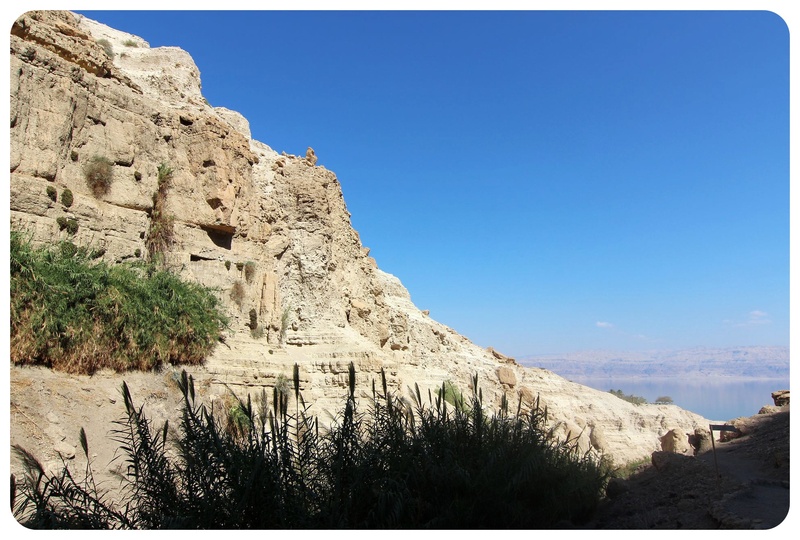 start the next morning, when I would climb a mountain to watch the sunrise over the Dead Sea.. read all about my road trip to Masada and Timna Valley here! 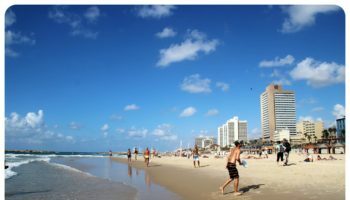 (Note: If you’re staying at the Abraham Hostel in Jerusalem, you’ll get these tours at discounted rates) The beach I visited, just south of Ein Gedi, is free, but there are other beaches (some of which charge admission.) 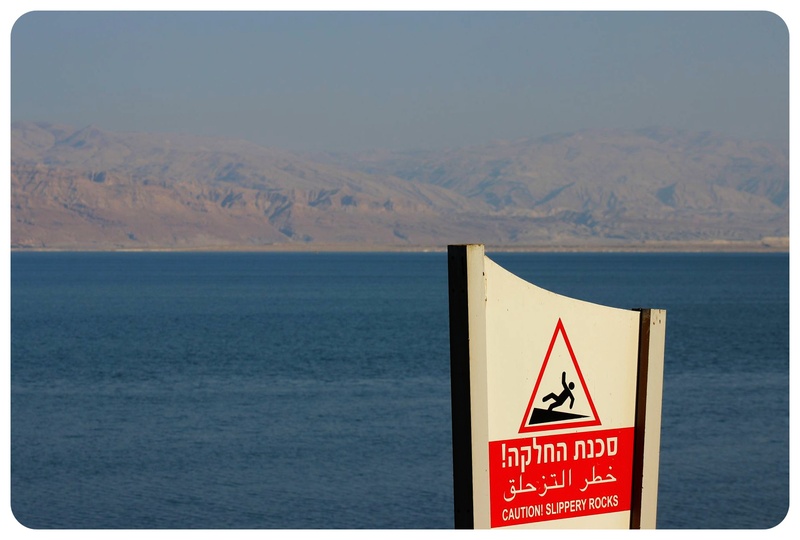 You can find a list of Dead Sea beaches here. 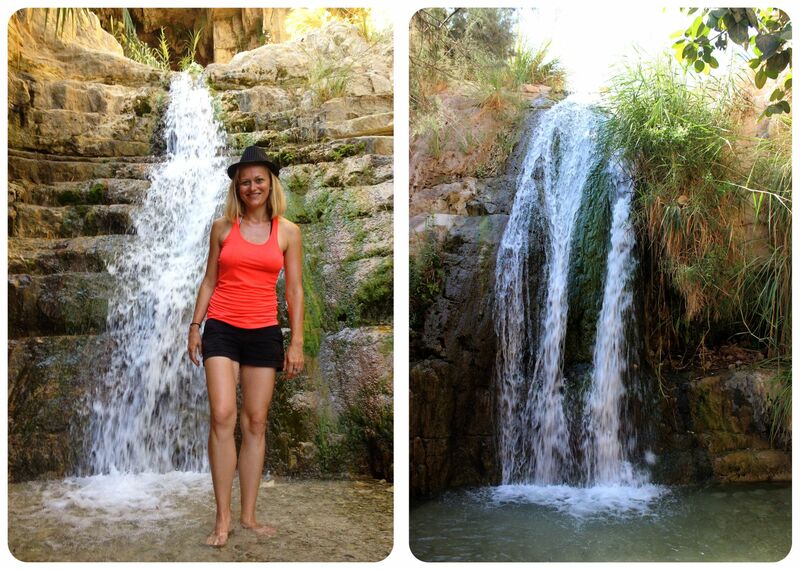 Ein Gedi Nature Reserve is open from 8am to 5 pm (April to September) and 8am – 4pm (October to March). Admission is NIS29 (US$7.50) for adults, NIS15 (US$3.88) for children and NIS25 (US$6.47) for students. Make sure to bring drinking water to clean off salt should it get into your eyes or mouth. Don’t forget your sunscreen – there is no shade and the sun is very strong in the desert. You don’t want to shave the day before your visit – trust me, even the smallest cut burns like hell when the highly saline water touches it. I tried really hard but I just couldn’t get my legs down! Insane. Happy to hear that I’m not the only one who feels reminded of Lake Powell 😀 Gotta google Mono Lake now! Dead sea was definitely one of my memorable moments. Loved giving myself a mud bath. I’m kinda the same don’t like swimming where can’t see my feet but there is no wild life so why not. You are right, De’Jav, I shouldn’t have been so freaked out about what’s in the water because it’s DEAD! 😀 Still, deep bodies of water do freak me out in a way. I also wouldn’t swim across the Blue Hole off the coast of Belize! 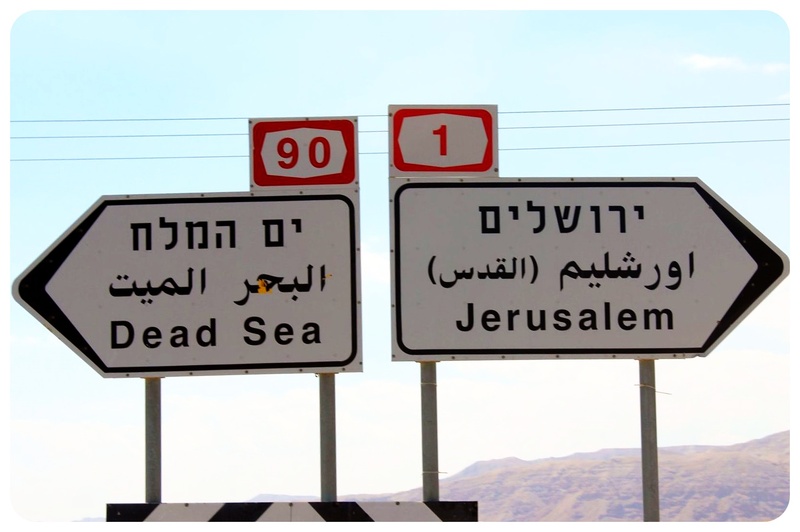 What a surreal place … hopefully both Jordan and Israel can work together to save the Dead Sea from becoming like the Aral Sea in Central Asia! Great story, this place has been on my list for a while, I can’t wait to see it in person some day. 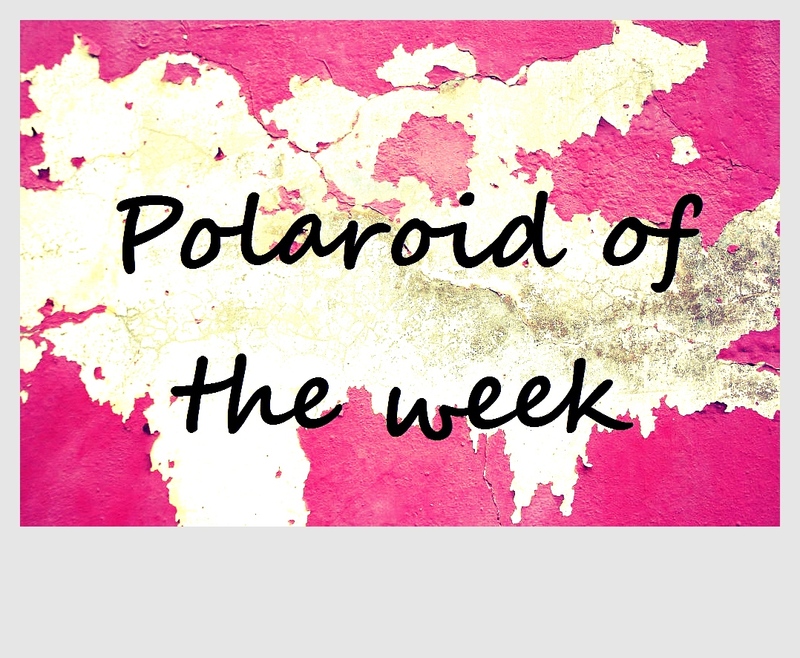 Keep on going lady, I love your writing and your photos!! Looks remarkable indeed I can’t wait to get there one day. Reminds me of Death Valley – so extreme.